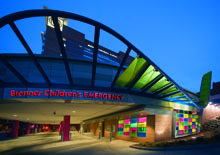 The Brenner Children's Hospital Nursery is a 47 bed, level 4 nursery that cares for infants transported from the surrounding 17 counties as well as other parts of North Carolina, Virginia and Tennessee. All subspecialty services are available to our patients including ECMO and cardiothoracic surgery. Ninety-nine percent of our patients are "outborn." There is no delivery service at Wake Forest University Baptist Medical Center. The few inborn patients that we care for are born during ex-utero intrapartum treatment procedures, from mothers admitted with severe trauma or from surprise arrivals in the emergency room. Learn more.